The West - Return to more environfriendly travel? Our transportation choices obviously have a major impact on the environment, so what can we do to lessen our impact on the planet and reduce our dependence on oil? Long-distance trains, so-called “heavy rail,” are making a comeback, despite setbacks. Amtrak in USA, as a whole has lost about $25 billion since it was created in 1971, a staggering sum until you consider the $40 billion annually spent on highways. Rapid-transit ferries can compete with cars in commuting times. The city of Sydney, Australia, for instance, makes major use of ferryboat commuting, as does Hong Kong, Seattle and Vancouver, British Columbia. There are some environmental problems and some cost issues with ferries, but, overall, when you have feasible water routes, it’s a great mode of transport. Biking is also gaining in popularity, for health, for its environmental benefits and to eliminate auto-related costs. The National Personal Transportation Survey found that approximately 40 percent of all trips are less than two miles in length—which represents a 10-minute bike ride or a 30-minute walk. Fifty-four percent of all commuters live within 10 miles of their worksite—making their commute time by bike or car just about the same. Employers also benefit, because studies show that people who bike to work are more productive and take less time off for illness. Bikers cut down on an employer’s need to subsidize employee parking, and exercise tends to make workers more alert. Europe is showing the way forward in many ways. European car-free zones have become very successful. Sixty cities have declared that they’re going to make their centers car-free. Britain has developed a car-free day, which is supported by 75 percent of the British public. Similar ideas have spread to Central and South America. In some places, such as Athens or Singapore, because of pollution problems, you can drive only every other day (license plates ending in an odd number one day, even the next), and London now is charging cars a hefty fee to enter the city center. In Copenhagen, Denmark, 30 to 40 percent of commuters get to work by bicycle. In a new study issued last week, automotive consumer information service Intellichoice.com reported that gasoline-electric hybrid cars and trucks—favored by environmentalists for sipping instead of guzzling gas—have significantly lower total cost of ownership than equivalent traditional gas-only models. “Across the board, we found that all 22 hybrid vehicles have a better total cost of ownership over five years or 70,000 miles than the vehicles they directly compete against,” said Intellichoice.com publisher James Bell. Intellichoice.com’s findings run contrary to previous analyses from Consumer Reports which concluded that hybrid owners cannot make up the higher up-front costs of a hybrid with fuel savings down the road. The key difference is due to the fact that Intellichoice.com factored in hybrids’ retention of resale value as well as the availability of various tax and financial incentives. The sea is steadily eating into the Sundarbans, the world’s largest delta and mangrove forest, threatening an ecological disaster for the Bengal basin region. The 20,000 square kilometre forest delta stretches across the lower reaches of the Bengal basin - 60% falling in Bangladesh and the rest in West Bengal. Satellite imagery shows that the sea level in the Sundarbans has risen at an average rate of 3.14 centimetres a year over the past two decades - much higher than the global average of two millimetres a year. Scientists believe that in the next 50 years, a rise of even one metre in sea level would inundate 1,000 sq.km of the Sundarbans. In the past two decades, four islands - Bedford, Lohachara, Kabasgadi and Suparibhanga - have sunk into the sea and 6,000 families have been made homeless. Two other islands - Ghoramara and Mousuni - are fast going under. The district administration has constructed huge embankments to ring the coastal inlands. But during high tides, the embankments are damaged. Some develop cracks and collapse. A total of 54 of the 102 islands in the Indian Sundarbans are still habitableAbout 2,500 sq.km have been set aside as a tiger reserve since 1973. 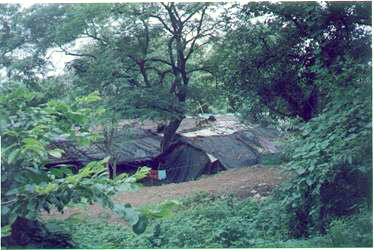 Since the first settlements in 1770, the population of the Indian Sundarbans has risen 200% to nearly 4.3 million. The population has put pressure on the ecosystem, which acts as a nursery for the aquatic resources of the Bay of Bengal. Scientists say that the Sundarbans, South Asia’s largest "carbon sink" - which mops up carbon dioxide - must survive to help prevent global warming. But will it? Dead Olive Ridleys have been spotted in large numbers at Gahirmatha, Devi river mouth, Jatadhar river mouth, Harishpur areas, Chilika coast and Puri. The situation went out of control at the Gahirmatha Marine Sanctuary after a forest guard by accident killed a fisherman from the Kharnasi village on December 14 last year. Angry fishermen snatched away seized boats, released arrested persons and also burnt down the patrol camp at Agarnasi on December 22. In the absence of armed police, forest guards have refused to carry out sea patrols to protect sea turtles. Although all trawlers have to use Turtle Excluder Devices (TED), not a single trawler is making use of them. A sum of Rs 10 million given by Indian Oil Corporation to the forest department in 2000 for turtle protection is yet to be used for speedboats. Similarly, the fisheries department had also got Rs 10 million from the Government of India for speedboats, which remains unspent even after eight years. Turtle Festival at Velas, Tal- Mandangad, Dist-Ratnagiri is being celebrated on 10th and 11th February 2007. Last four years Sahyadri Nisarga Mitra (SNM), Chiplun, has been working in Marine TurtleConservation in Maharashtra. Velas is 225 Km from both Poona and Mumbai. In this period SNM released 7610 hatchlings from152 protected nests. This year 28 nests are protected on entire coast of thestate, and at Velas there are18 nest till today. On 10th and 11th February, 2007 in the mornings and evenings there is a chance to observe the emerging hatchlings from the nests at Velas. This dates are based on last four years experience. SNM is making simple homestay arrangements for tourists and wildlife lovers who would wish to watch the hatching of the turtles on the two dates. They can observe how the marine turtle conservation project is going on, hatcherymanagement, meet the locals who are actually working, film turtles, Coconutgardens and the beach. Frequently overshadowed by bigger, better known inhabitants of India’s jungles, such as the tiger, elephant and leopard, little is known about the clouded leopard. . A smaller member of the “big cat” group, this creature, weighing between 11kg and 20 kg, is found in the jungles of north Bengal, Arunachal Pradesh and Meghalaya as well as China and parts of south east Asia. Neora Valley National Park in Darjeeling has begun its first survey of the clouded leopard in an attempt to find out more about this elusive, endangered species. The survey hopes to find out the estimated clouded leopard population of the park, as well as observing daytime and nocturnal behaviour and its prey base. The year-long study, jointly carried out by the state forest department and Nature Environment and Wildlife Society (NEWS), a voluntary organisation, will also look at eco-tourism prospects in the park. The 88 square kilometre park is also home to the endangered red panda and musk deer. Other species include leopard, five species of civet, black bear, sloth bear, golden cat, wild boar, barking deer, sambar, Himalayan flying squirrel and Thar. Social and environmental film makers all over the world are, generally speaking, a much troubled lot on the financial front. What keeps them going, more than anything else, is their commitment to the cause. Unfortunately, these thought provoking films rarely get audiences as they face a challenge of distribution. Television channels either do not run them or, if they do, there is no guarantee of attracting enough eyeballs. Television screens that are sometimes installed in offices. Create a kind of a You Tube on the intranet so staff can watch these on their desks itself. Collective Screening: Call staff in groups to a common room, and screen for them. No doubt people watching in a group would be impacted more as they would have a chance to discuss the same with one another, then and later too. Distribute discs: Get multiple copies of such films on suitable discs and distribute them amongst staff. Go a step further. Start giving these to customers who make a certain minimum purchase from you. Why give a free soap with a shampoo? Give a film. I had the privilege of listening to Jane Goodall at the Brish Council on 21 Jan 2007, while she was addressing the audience of "Wildscreen India". Jane Goodall is intenationally known as the saviour of chimpanzees. But it was indeed more thrilling to listen to her enthusiasm for the "Roots and Shoots" program she has initiated in 100 countries and is soon starting in India too. Roots and Shoots of plants have the uncanny ability to pierce/sprout through brick walls. She believes that the brick wall of unsustainable development/global warming will have roots and shoots growing all over soon - roots and shoots being the young workers she is organizing into groups of grassroot workers from all corners of the world. The youth of today and even senior citizens can be mobilised for action and they are our "Reason for Hope"
Do visit the site http://www.rootsandshoots.org for more info. After reading about the plight of Borivili (East) hills, Mumbai, I decided to visit the West side of Borivili Hills whch is also known as Sanjay Gandhi National Park. 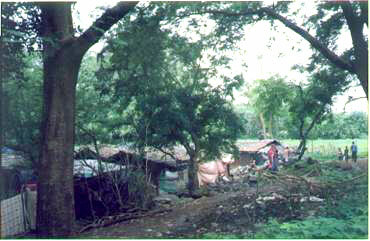 The park is described as the Green Lung of Mumbai and treks and trails criss cross the park. At the gate we were told that there is no arrangement for any kind of transport to Kanheri caves. We can walk if we wish. And walk we did. The trails along the monorail track were littered with waste and human excreta. We had to watch each step. But soon the overpowering stench was so unbearable that all we wanted to do was return to the clean air of Mumbai. Here are some pictures of the Park which I took. They tell a story which do not need any words. "We also have a right to live and enjoy. We are few in numbers. Please allow us to survive. 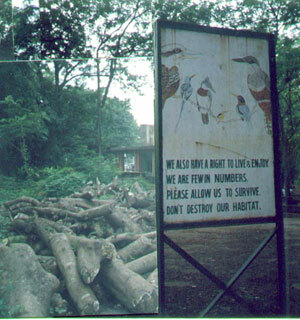 Don't destroy our habitat." The beautiful dancing peacock has been an inspiration to all Indians to aspire for beauty and dignity. On one of my visits to Himachal Pradesh I visited the pheasantry at Sarahan where I saw the other relatives of the peacock-lesser known members of the pheasant family. 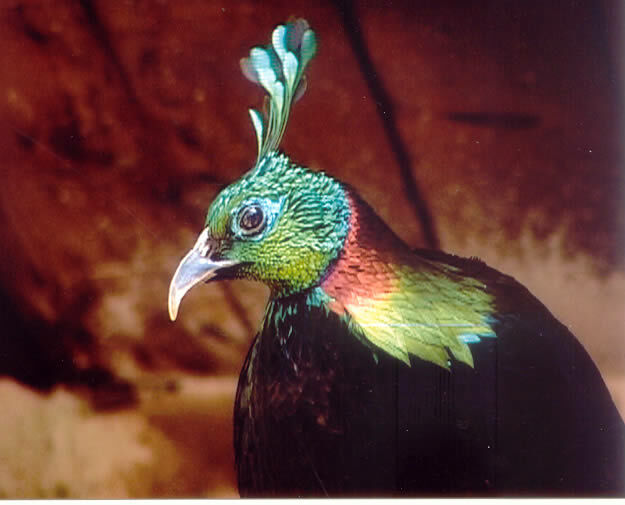 The Himalayan Monal with the stern and clever look and a rainbow on its tail feathers left a lasting impression. Both my husband and I are happiest when out in the wilderness and before long we were planning a trip to Kedarnath Wildlife Sanctuary, in Uttaranchal India, which is the home of the Himalayan Monal. We travelled by road, driving from Delhi to Rishikesh on the first day. 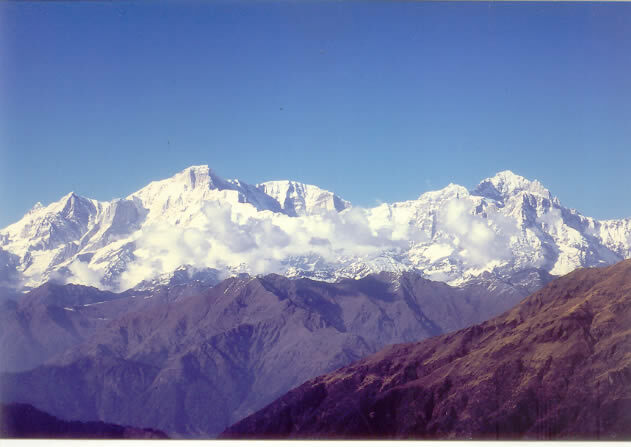 After halting at Rudraprayag, we proceeded the next day to Chopta via Mandal and Gopeshwar. Once in Chopta, you already soak in the mountains of KedarNath Wildlife Sanctuary. The forests of Kedarnath Sanctuary is the catchment area of Alaknanda River. The forests comprise a Musk Deer Sanctuary and also reserve forests where villages exist, supporting reasonable good forests where one can hear the call of the koklass pheasant and monals early in the morning. Sighting monals is not that easy as these birds are extremely shy and vary of human presence. From Chopta you can take up the bridle path to Tungnath temple (trek/horse) –about 5 km-and you will flush monal enroute. The peaks of Kedarnath which can be reached after a 14km trek, transport one to a heightened spiritual experience. It is no wonder that the majority of Indians who trek these mountainous routes or ride up the bridle path are seeking spiritual fulfillment. The peak “Kedarnath” is believed to be the abode of Lord Shiva. 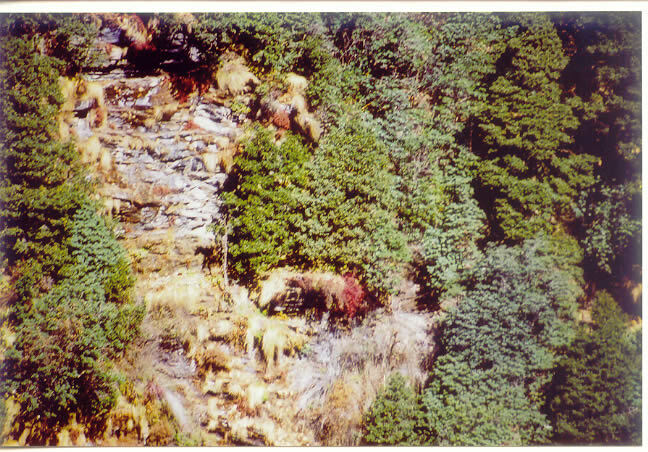 This biological reserve of Kedarnath Wildlife Sancuary is 975 Square Kilometer in area. It is home to a number of endangered animals such as Musk deer, Himalayan tahr, Serow and Pheasants. 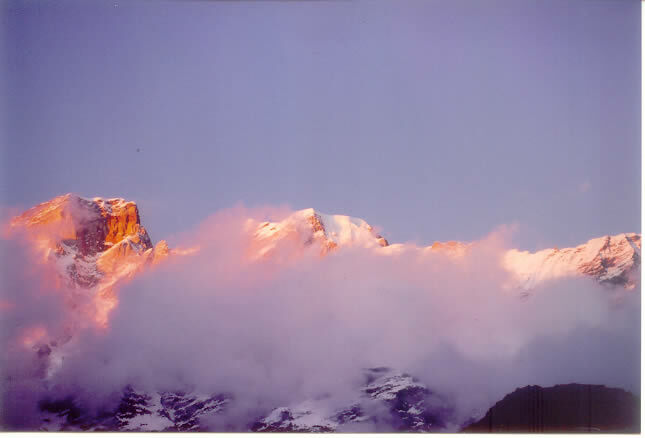 The sanctuary is part of the Garhwal Himalayas. 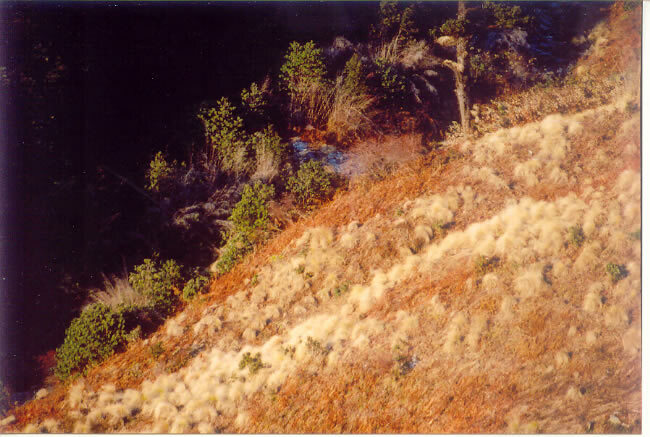 The vegetation is diverse and most of the forest types are sub-tropical, temperate, sub alpine and alpine. The undulating terrain ranges from about 1700’( 518m) to 22,901’(6980m). From Tungnath you could take another bridle path to Shokharkh - a less used path in forests but lots of chances to flush monals and observe them. You will have a good sightings of kalij along the motor road above Mandal and definetly hear Koklass pheasant at Shokharkh.